As you may have already heard, Ford’s 1.0 liter three-cylinder EcoBoost engine was recently presented with the 2013 International Engine of the Year (IEOTY) award, marking the second straight year that The Blue Oval’s minuscule powerplant has earned the honor. To ensure that the German Public at large was aware of Ford’s achievement, the automaker sent its Frankfurt Motor Show correspondent Paco Erhard to the streets of Frankfurt to tell them all about it. After overcoming the initial discomfort of telling German people that an American car maker won the IEOTY, Mr. Erhard began to ask random individuals who they thought made the best automotive engines in the world. The answers ranged from Dailmer, BMW, Audi, and Mercedes; never did anyone mention Ford, until Paco revealed The Blue Oval’s triumph. Interestingly, the public seemed to scoff at the notion that an American automaker could ever win such an award. Designed at Ford’s research and development centers in Aachen and Merkenich, Germany as well as Dunton, U.K., the multi-award-winning 1.0 liter EcoBoost three-pot is built in Cologne, Germany and Craiova, Romania. Powerful and fuel-efficient, it made its debut on the European-market Focus and is currently offered across a broad range of small Ford cars, including Fiesta, B-MAX, C-MAX, and Grand C-MAX. Ford has plans to offer the engine in larger cars including the new Mondeo (aka Fusion in North America), the Transit Connect and Transit Courier commercial vehicles, and the Tourneo Connect and Tourneo Courier people movers. Notably, the engine has received the highest score in the history of the IEOTY while also winning the “Best Engine Under 1.0-litre” category at the annual awards presented by Engine Technology International magazine. 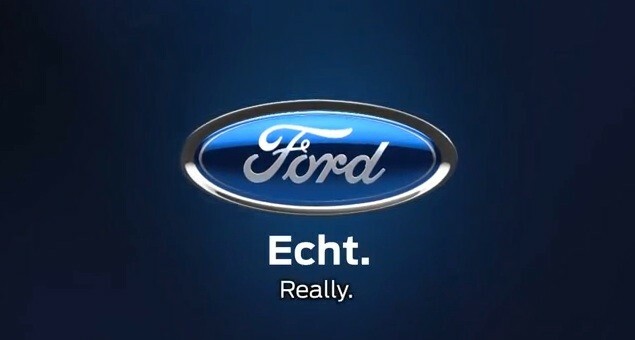 For those curious, in the image above, “Echt” means “really” in Germany.